I enjoyed this one and the first. It was years ago that I rented them from the library and I was SO disappointed when I couldn't find the third. If I find Book 3, I'll let you know. Have you tried online? The books sound like something I'd really enjoy! I'm gonna write the titles/author down. Thanks, Susan! Jane is a wonderful writer. I'm amazed by her ability to create so many lifelike characters. I've not read this one. Thanks for the review! I suggest you read the first book in the series before "No Eye Can See." You'll enjoy the second one a whole lot more if you have all the background. A good review...makes me want to read them! I'll be sure to put these books on my Amazon wishlist! 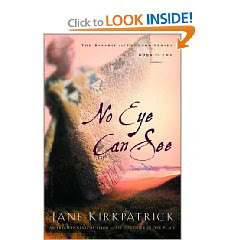 I know Jane Kirkpatrick has won awards for her work. I look forward to the day when I have a moment to check out one of her books! I hope you find my recommendations helpful. 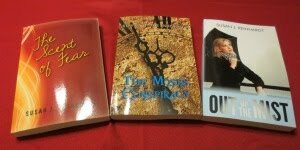 I've read each of these books, and enjoyed them. Ooo, I'd bring the book! The chocolate sounds yummy. I might have a little problem with the distance. I'm adding these to my list. Thanks for the review, Susan. These books sound lovely. Hey,Susan! This book sounds really interesting. I don't think I've read Jane before. Thanks for showcasing her! I had the privilege of interviewing Jane a while back. Now, I'm reading as many of her books as I can find. Jane's books not only illustrate the value of research, but they also contain a lifetime of valuable insights into the human heart. I think you'd enjoy these books. I not only enjoyed the stories and characters, but learned a lot about writing. Thanks for stopping by and commenting. If you have a chance to read Jane's books, I think you'll be impressed with her wisdom and skill. Sounds like another good one. Wish I read faster and that there was more time in a day! My "to be read list" is very long at the moment. At the rate of one book per week, I could only read 52per year. Sometimes it takes two weeks to read a book, so that number is high. This sounds like a series I'd be interested in reading. Thanks for sharing it. Of course, I'd have to be careful of the chocolate. The cover matches the theme of the book. I thought they did a great job.